One of the common misconceptions about custom homes in Calgary is that you have to buy a new lot before you can build your home. The expenses involved with purchasing a plot of land and financing the construction of a new house can put some people off, but current homeowners have another option — one that could reduce costs by hundreds of thousands of dollars. If you already own your own home, it is possible to completely rebuild your house on your current property. In fact, in some situations, this may actually be the best possible course of action. An obvious benefit of rebuilding on your current lot is that you don’t have to move to a new location. If you’re already located in a good neighbourhood with rising property values and all the amenities you need, why leave? Building a new home on your current lot will only accelerate the return on your investment, as a new, more energy-efficient house will most likely appreciate at a faster rate than your current lodgings. Also, new custom homes in Calgary can cost less per square foot than renovating your current house. This is particularly true if you are trying to update an old house with some fundamental energy efficiency problems. Renovation projects are also notoriously difficult to manage. Costs can swell far beyond initial projections and estimates, and schedules for completing the work often go out the window. By contract, rebuilding custom homes in Calgary is much more predictable. Most rebuilds are completed with few, if any, surprises when it comes to costs and scheduling. Thus, they’re a far less risky proposition than hiring a contractor to execute major renovations or home additions. It’s also well worth taking into account the fact that you may also minimize disruption to your family. If you’ve got school-aged children, they won’t have to go through the stress and uncertainty of changing schools. You’ll also get to keep your current neighbours, and if you’ve ever had bad neighbours, you know how big a difference it can make to have good ones. Most of all, a rebuilt home will save you a great deal of money, year in and year out. Today’s smart home systems and technologies are far more efficient than the building practices used when your older home was built, so you’ll enjoy dramatically reduced operational costs that could lead to tens of thousands of dollars in savings. As an added advantage, you’ll bypass the hassles and expenses associated with purchasing a house on the resale market. Finding the right house in the right neighbourhood can take months, and even then, you may have to compromise on certain features for the sake of moving the process forward. You will also save on real estate agency commissions and the many other closing costs and expenses that can add up to thousands of dollars. Custom Homes Calgary: Questions about the Rebuild Process? 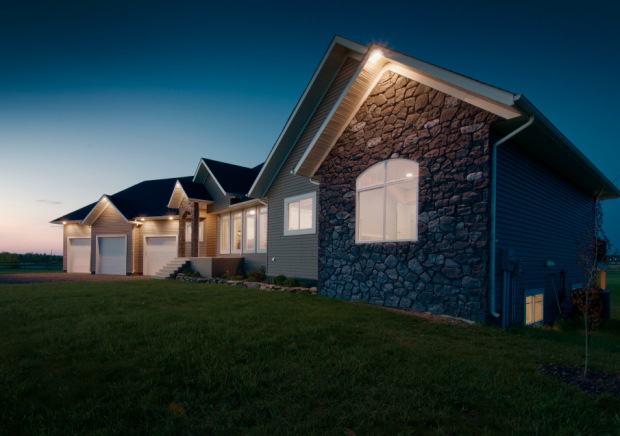 The advantages of custom homes in Calgary are too enticing to ignore. If you’re thinking about building a new home, you owe it to yourself to explore the many benefits of custom home ownership. At Fine Line Homes, we use state-of-the-art building technologies and advanced construction techniques to ensure all our homes deliver optimal energy efficiency and comfortable living for years to come. Starting with customized floor plans, we put you in the driver’s seat throughout the design process. From there, our architectural and engineering professionals take a hands-on approach, working closely with you to bring your dreams to life. Custom homes in Calgary are more affordable than you might think, especially if you choose to build on your own lot. You don’t have to compromise on your goal of custom home ownership just because you’re on a budget, and we at Fine Line Homes are happy to explain how. If you have any questions about the home rebuilding or custom home construction process, please don’t hesitate to contact us.